← Why Is Mayor Dyer Still Holding Up Barber Park Deal? There was a slight uptick in SunRail ridership last month, which is good news for the commuter line after months of low, but steady numbers. July ridership exceeded the numbers from the last three months and almost matched March ridership, which had a daily average of over 4,000 boardings. According to the Florida Department of Transportation, the July conductor’s report shows a daily average of 3,892 total boardings last month. 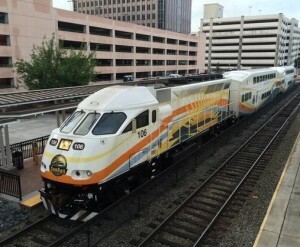 The slight increase is about 200 total boardings, or 100 riders taking a round-trip on SunRail, more than the month of June. The July numbers could have been even higher, but no special train service was available during the 4th of July weekend. Ridership numbers in July also broke 4,000 total boardings during five days of the month. SunRail experienced nearly 90,000 total boardings during 22 days of service last month. However, weekly and monthly passes remain low, and only 422 SunCards were sold last month according to transportation officials. 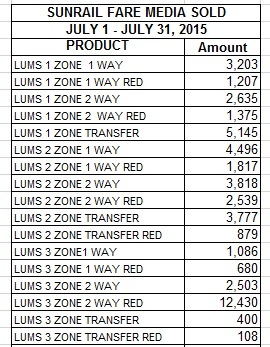 More than 48,000 limited use media (LUMs), tickets for one-way trips or round-trips, were sold in July. Local officials have been expecting ridership numbers to increase as construction of the I-4 Ultimate project continues to ramp up. There has also been a renewed push to raise awareness of the commuter line within the business community. FDOT officials also stated they will no longer perform or report bicycle counts. Previous monthly reports for bicycles have shown very low counts, something local officials hope to change in the coming months. 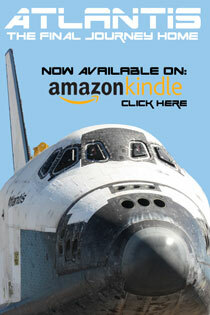 However, there will be no official counts or reports to track the progress any longer.